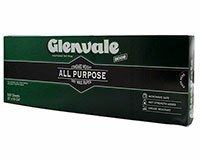 Contains 500 15 x 10-3/4" Sheets of Dixie® Glenvale® Interfolded Deli Wrap. For general deli food service and meat counter needs. Why use Dixie Interfolded Deli Papers? Improve food presentation with a clean and bright white surface, designed to "release" easy from moist deli products, helping to enrich the appearance of deli products promoting a quality image. Dry wax impregnated to withstand moisture and grease. Wet strength additive to resist tearing and breakdown over time. Dispenser box is packed with a special feature to hold sheets in a position ready for dispensing everytime.